That thought still makes my heart race a bit each morning, 40 years after the day I stripped the fiberglass off a discarded longboard and excitedly whittled away at the misshapen blob with a Surform and a Hamilton Beach electric poultry knife. Each time I cut into a fresh surfboard blank I feel that I am sharing in the discoveries made in those spellbinding early years of the modern surfing era, when it was possible for any surfer with a planer and a garage to liberate from a rough slab of balsa or foam the power to angle tighter, to ride deeper, to extend control into bigger and bigger waves. “For about 30 years there was a period when aeroplanes would fly when you wanted them to, but there were still fresh things to learned on every flight, a period when aeroplanes were small and easily built so that experiments were cheap and new designs could fly within 6 months of the first glimmer in the mind of the designer." 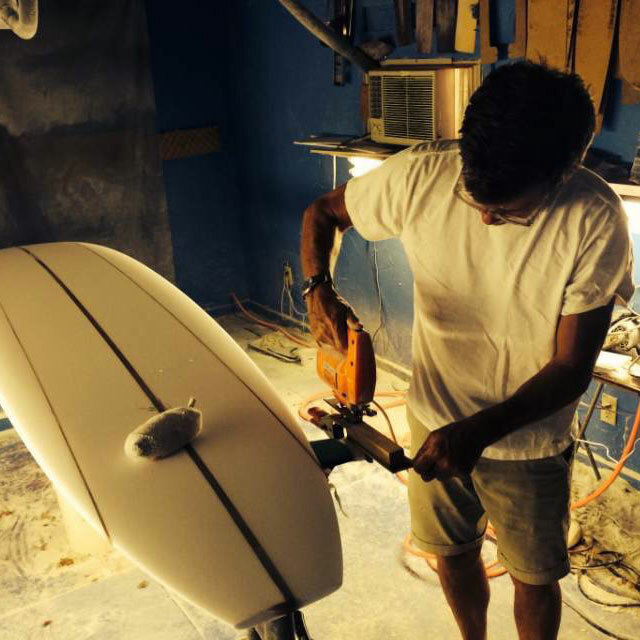 My life’s work as a surfboard designer is founded on the belief that we can retain in surfboard building that halcyon period by keeping things simple, keeping in the backyard and garage, by never allowing things to get so complicated and expensive that a surfer can no longer build an experimental surfboard overnight and have it in the water the next morning. Skin a block of foam, whittle it, lay it up, take it in the waves and try it. …Backyard is where it’s at! I Instagram, therefore I am. Backyard plein air shaping on a decidedly wilted-looking 5’10” Stinger, employing that most favored crutch of the novice shaper: the Surform. For the dust to be safely carried into the neighbor’s garden I had to wait until the wind blew onshore — which in Cayucos means I didn’t have to wait long. Flight-testing a 6’6" Stubb-Vector on the perfect, empty walls of a Skeleton Coast left point. This was the second one I had shaped for myself and felt like having a jet ski compared to the garden-variety shortboards of the day. Here it is over 20 years later and the Stubb-Vector still garners a large percentage of my orders. Prepping a T-band tailblock for a 9’8” triple-stringer longboard, an homage to my favorite surfer/shaper of all time: the incomparable Phil Edwards. Attired in Dale Velzy’s classic uniform of chino shorts and white T-shirt to help channel the Early Years mojo.